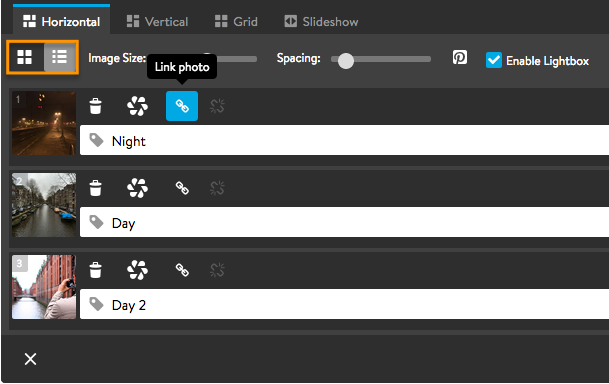 Jimdo currently has four options for displaying Photo Galleries: Horizontal, Vertical, Grid, and Slideshow. Learn more about the different options and settings below. 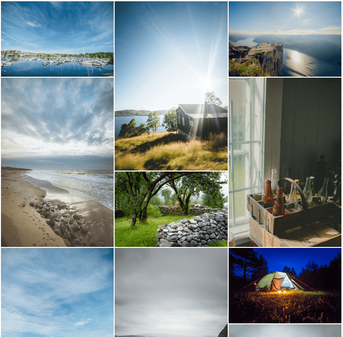 Once you add the Photo Gallery Element, you can upload multiple photos at once by clicking the browse button. Just like with a Photo Element, galleries aren't limited to only photographs. You can upload images, graphics, badges, icons—any file that's a .jpg, .png, or .gif. Once you upload your images, you'll see a view similar to the example below. The top part shows you a preview of what your gallery will look like on your site. The middle gives you the different settings to choose from. The bottom part shows you the current images in your gallery and lets you rearrange or delete them. Click on the Grid or List buttons (outlined in red) to change how they appear to you. With List View, you'll see more options like rotate, add link, and add caption. If you want people to be able to click on an image in a gallery and have it link somewhere else, you can add a link. To add a link, you must be viewing your images in List View (outlined in red below). Once you're in List View, click on the Link Photo icon to add a link. 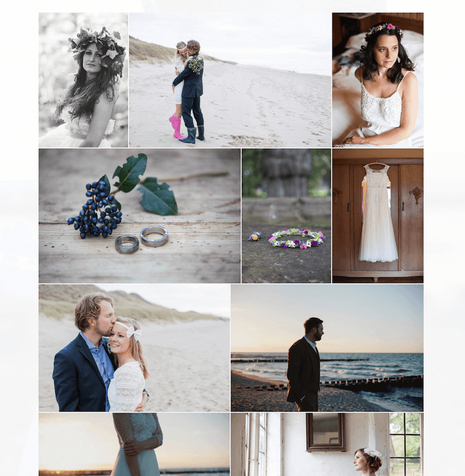 Now that you've uploaded your image files, you can choose from the many options the Photo Gallery has to offer. Here's a rundown of the choices: Horizontal, Vertical, Grid, and Slideshow. The Horizontal View has a modern, dynamic feel to it. Your images will appear in their original proportions and fit together seamlessly based on their width. Image Size: Adjust the slider between 1 and 3 to set the size of the images. Spacing: Adjust the slider between 0px and 20px to set the amount of empty space between images in the gallery. Pinterest: If you enable Pinterest sharing, a small "Pin It" button will appear in the top right of your images. 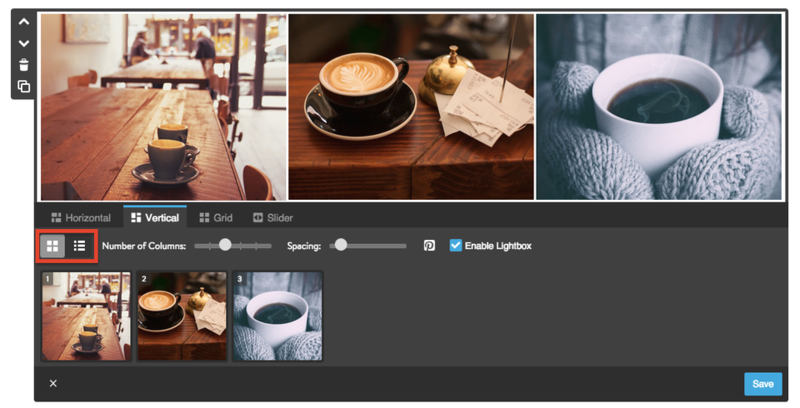 Enable Lightbox: Check this box if you want people to be able to click on an image to see a larger version. The Vertical View displays your images in columns, based on their height rather than their width. You choose how many columns of photos you want displayed side by side, from one to six. Choose one column, and your photos will display across the full width of your content area—perfect for showing off large images. 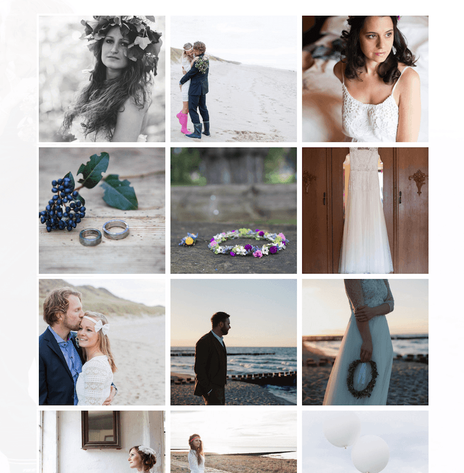 Choose more columns and your photos will display at smaller sizes, in columns side by side. Number of Columns: Move the slider between 1 and 6 to set the number of columns in your gallery. This will also affect the size at which the images are displayed. The Grid View will show your images in uniform squares. This means that they will be either resized or cropped to fit within the squares of the grid. For best results, we recommend cropping your photos into equal-sized squares before you upload them, using a photo editing program like Pixlr. Proportion: Choose whether you want your image to fit in its original proportions to be cropped into a square. If you choose to crop, parts of your images may be cut out. Size: Click the (+) or (-) buttons to make the thumbnail images larger or smaller. Style: Choose from three thumbnail styles: Cozy, Compact, or Comfortable. This will change the border and amount of space between images. With the Slideshow, you can rotate through multiple photos. Speed: Adjust the slider between slow and fast to set the amount of time each image will appear. Preview Thumbnails: Check this box if you would like small thumbnails of each image in the slideshow to appear at the bottom. Autoplay: Check this box if you want the slideshow to start playing automatically when the page loads. Style: Choose whether you want the left and right scroll buttons to be dark or light. To create a carousel effect on your homepage, add a Slideshow and link each image to a different page of your website.